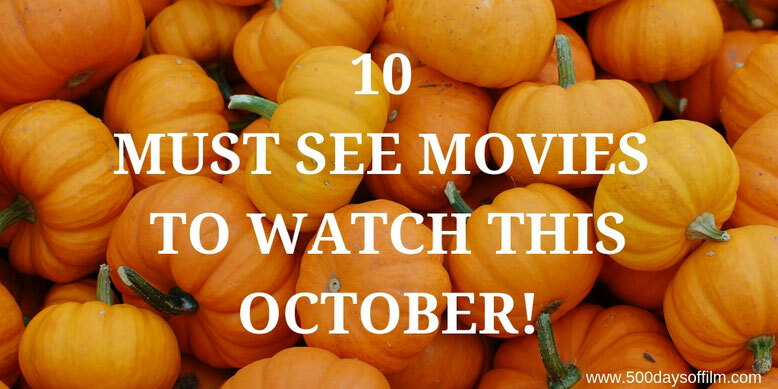 10 Must Watch Movies This October! I had to buy some wrapping paper last week and was shocked to find the shop full of Christmas cards… seriously who buys Christmas cards in September? Plus, wasn’t it January like two weeks ago? One thing is for certain, 2018 is flying by. The good news is that we still have lots and lots of movies to look forward to watching. But first, how was your September? What did you see? What do you wish that you hadn’t watched? Do let me know (there’s a comments section below). My favourite film of September was American Animals. I just loved the way Bart Layton told this true story and how his film explored uncomfortable issues of privilege and entitlement in today’s society. I also enjoyed Searching, A Simple Favor, Crazy Rich Asians and The Little Stranger. I did not, however, like The Nun. Really, how can a film about a demon nun in a creepy abbey in Transylvania be so dull? Moving swiftly on, let’s take a look at what movies are in store in October! I cannot wait to see A Star Is Born. There is much (Oscar) buzz surrounding Bradley Cooper’s movie - and about Lady Gaga’s performance in particular. Okay, so the trailers have not sold Venom as a must watch movie and Upgrade may have stolen its thunder. However, look at that cast - surely enough to grant Ruben Fleischer’s film an open-minded watch. Released in the US in January 2017 (nope that’s not a typo, 2017! ), Columbus is a film that I have been wanting to see for months and months. It is about a Korean man who finds himself in Columbus, Indiana where his father is in a coma. By all accounts this is an architecturally beautiful movie with a stunning performance from Haley Lu Richardson. As soon as I watched its trailer, I knew that I just had to see Bad Times At The El Royale. The film features such a impressive cast and looks like the twisty fun we have come to expect from director Drew Goddard. How do you follow a film like La La Land? With a trip to the moon, of course. In First Man, Damien Chazelle teams up with Ryan Gosling once again to tell the story of astronaut and first man on the moon, Neil Armstrong. Mandy looks bonkers with another classic, crazed performance from Nicholas Cage. Therefore, it is an absolute must-see in my book. I really enjoyed Angie Thomas’s book, The Hate U Give. As a result, I am looking forward to watching George Tillman Jr’s adaptation of this story about race and violence, love and acceptance. Bohemian Rhapsody has had a troubled journey to our screens. Late in the day, director Bryan Singer was fired - reportedly for being absent from set and for clashing with both cast and crew. Dexter Fletcher was then brought in to finish the movie. It is hard for me to believe that anyone (even someone as talented as Rami Malek) could replicate the magic of Freddie Mercury but I will still watch this with a hopeful, open mind. I am intrigued by Gus Van Sant’s new movie. It looks to be heartbreaking and darkly funny and features an amazing cast. You had me at Joaquin Phoenix. What movies are you most looking forward to watching in October? You can leave me a comment in the box below or let’s chat over on Twitter. You can find me @500DaysOfFilm.